RALEIGH, N.C. (AP) — A federal jury on Thursday awarded more than $50 million in damages to neighbors of an industrial hog operation found responsible for intense smells, noise and other disturbances so bad people couldn’t enjoy their rural homes. Jurors on Thursday awarded the 10 neighbors of a 15,000-head swine operation a total of $750,000 in compensation, plus $50 million in damages designed to punish the corporation that owns the animals. 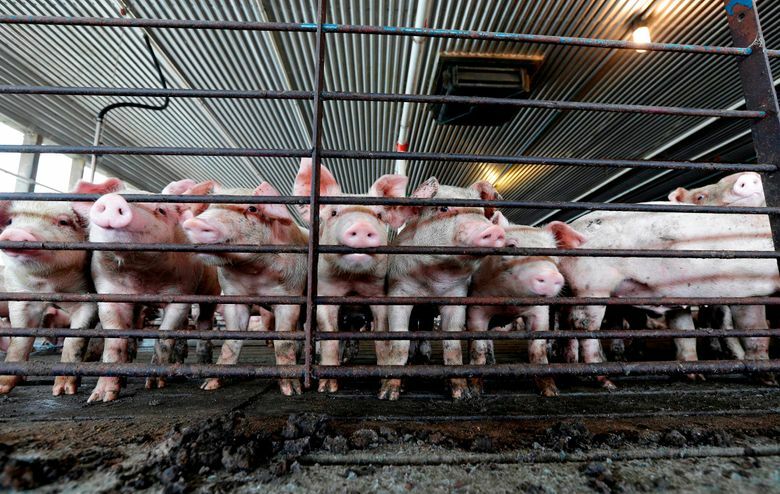 Lawyers didn’t sue the Bladen County farm’s owner, instead targeting the hog-production division of Virginia-based Smithfield Foods. The Chinese-owned company uses strict contracts to dictate how farm operators raise livestock that Smithfield owns. The decision is the first in dozens of lawsuits filed by more than 500 neighbors complaining about hog operations. Rural residents have complained about smells, clouds of flies and excessive spraying for decades. But local and state politicians have either supported or backed down in the face of a politically powerful industry. North Carolina legislators last year changed state law to make it much more difficult to replicate the string of nuisance lawsuits targeting hog operations like the one decided Thursday. Smithfield Foods said it would appeal the decision. “The lawsuits are a serious threat to a major industry, to North Carolina’s entire economy and to the jobs and livelihoods of tens of thousands of North Carolinians,” Senior Vice President Keira Lombardo said in a statement. Smithfield Foods hasn’t changed the locally dominant method of hog waste disposal since intensive hog operations multiplied in North Carolina in the 1980s and ’90s. The practice involves housing thousands of hogs together, flushing their waste into holding pits, allowing bacteria to break down the material, then spraying the effluent onto fields with agricultural spray guns. Neighbors say the spraying sends the smells and animal waste airborne, allowing it to drift into their homes and sometimes coat outdoor surfaces on their properties. This case, presenting with the plaintiffs and the specific farm, was chosen by suing attorneys. Although the size of the jury award is large, the result of the next trial could be more telling since the parties were chosen by Smithfield’s attorneys, said Drew Kershen, an emeritus law professor at the University of Oklahoma and a past president of the American Agricultural Law Association. “If you got a second test case, chosen by the defense attorney, which turns out to have damages like this, then you would really have to say, my goodness these are really significant claims against the industry in North Carolina,” he said.